Since 1995 he has started a project about notation of space, called “smooth compound-eyes -> super-eye”. 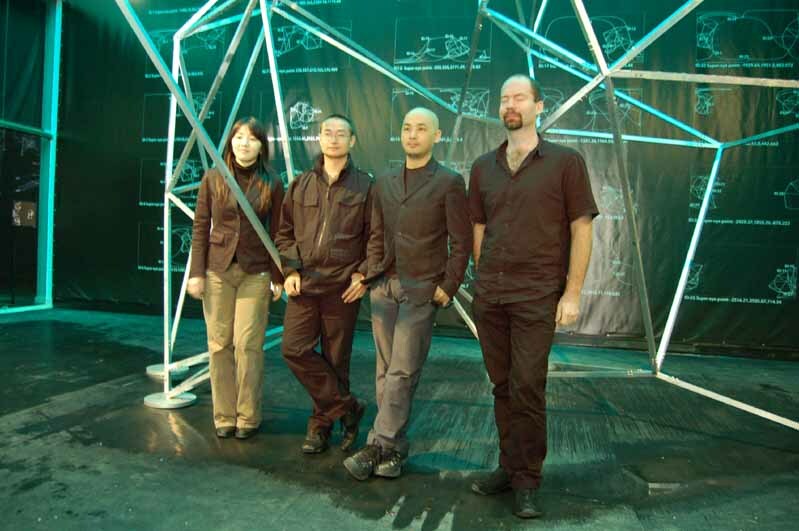 In 1997, he collaborated with Knowbotic Research for “IO_DENCIES – Tokyo” (co-produced with Canon ARTLAB) as an architect and an urban researcher. In 1998, he worked for Hinaya Project in Nishijin, Kyoto, a sukiya construction of Shusaku ARAKAWA and Madelaine GINS. In the same year 1998, he set up doubleNegatives Architecture. Since 2001, he has workshops in Tama art university and Zokei university. Since 2003, he has produced “gravicelles – Gravity and Resistance”, a collaborative project with Seiko MIKAMI at YCAM – Yamaguchi Center for Arts and Media (Yamaguchi, Japan, 2004), DEAF04 (Rotterdam, the Netherlands, 2004), transmediale.05 (Berlin, Germany, 2005), SHARE (Torino, Italy, 2005), VIA (Maubeuge, France, 2005), EXIT (Creteil, France, 2005), Ars Electronica (Linz, Austria, 2005), ICC (Tokyo, Japan, 2005), OOH Festival (Gijon, Spain, 2006), Mois Multi (Quebec, Canada, 2007), EL MEDIO ES LA COMUNICACION (Santa Cruz, Spain, 2007), ICC (Tokyo, Japan, 2008) . Member and founder of several non-profit and commercial initiatives, spread between commercial-grade and open source software engineering, artificial life and emergent systems research, media- and bio-art projects and community radios. Founder and former member of Nextlab, an open lab for new media in Budapest, Hungary. Former member and board member of Tilos Radio, a community radio station in Budapest, Hungary. Founder and former member of the Emergent Systems Research Institute in Budapest, Hungary. Founder and CTO at EU Edge LLC, an outsourced software development company catering mainly to US customers from Budapest, Hungary. Member of the double Negatives Architecture group, Tokyo, Japan, working on the generative architecture project called Corpora. Founder and organizer of the Budapest New Technology Meetup, a monthly gathering of new-tech enthusiasts in Hungary, Budapest. Founder and vice president of the Open Standards Alliance, an organization aiming to promote interoperabilty in the IT industry. His artwork focuses on interactive installation, software and sculpture. His work has been exhibited at Liste 01 Art Basel, Ars Electronica Linz, 4.Interlokalen Dada-Festwoche Zürich and ICC Tokyo and includes collaborations with other artists, such as Knowbotic Research, Felix Eggman and Raphael Perret. Since 2003, Max Rheiner lectures at the Zürich University of the Arts(Zhdk) and is head of the Laboratory of Physical Computing, where he developed ‘DaKa’, a hard and software environment that provides easy access to interactive computer technology for art and design students. Max Rheiner studied electronics and worked as a software developer in the field of Computer Aided Design. After a few years of working experience he studied at the Zürich University of the Arts and graduated in 2003 in the Department of New Media. He has spent three months in Japan as an intern for NTT InterCommunication Center [ICC] in Tokyo in 2001. She works as graphic designer, digital retouching artist of still life photograph, leads unICoRn. London International Advertising Awards Finalist. She is in charge most of graphic design and visual images of doubleNegatives Architecture. He is a graduate student of Information Art Course, Department of Information Design, Tama Art University, Tokyo, Japan. His main interests are sound and software art. 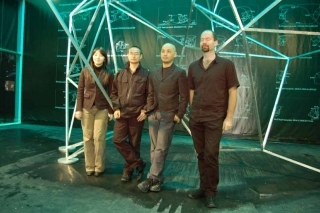 He mainly designs original signal processing and 3d graphics software and electronic musical instruments for the real-time performance of his audio-visual works. He had dedicated himself in design studio tutor in “Arnhem Academie van Bouwkunst” (2001), design for “Directie Nord Zee,” a Dutch ministry building, a prize wining project in VMX Architects (2001), structural engineering for “Montjuic 2, Barcelona” and other projects in Sasaki Structural Consultant (2003). He established NAL and designed “mercibeaucoup, Kyoto” in 2006 (Collaboration with J. Endo & M. Sumiyoshi) and others. Freelance artist, curator, cultural manager, editor of numerous cultural TV programmes. He writes art critics for Hungarian art-periodicals. Former artistic director of the Pixel Gallery, in 2005 initiated and launched a highly successful series of exhibitions of important video artist, and from 2007 he organized the NetArt exhibition series, the only software art venue of Hungary at the same exhibition space. Commissioner of several large scale art projects, both internationally and locally, he is a well known advocate of progressive artistic thinking in the Hungarian art scene. ABE Kazunao is artistic director and chief curator at the Yamaguchi Center for Arts and Media (YCAM). He studied aesthetics and art history at the Faculty of Fine Arts, Tokyo National University of Fine Arts and Music. From 1990 to 2001, he worked on various original media art projects, such as “LOVERS” by Teiji Furuhashi, “IO_DENCIES” by Knowbotic Research and “polar” by Carsten Nicolai and Marko Pelijhan, as a dedicated co-curator at Canon Artlab in Tokyo, the art support program by Canon Inc. He was involved in the establishment of YCAM, and was appointed his current position in 2003 and has worked as a producer for “C4I” and “datamatics” by Ryoji Ikeda, “gravicelles – gravity and resistance” by Seiko Mikami and Sota Ichikawa, “WORLD B” by exonemo, “LIFE – fluid, invisible, inaudible …” by Ryuichi Sakamoto and Shiro Takatani, “ENSEMBLES” by Otomo Yoshihide and others. In 2005, he served as a jury member of Transmediale 06, the international competition in Berlin.